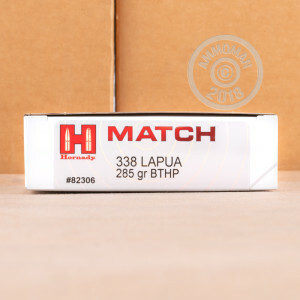 This .338 Lapua ammunition from Hornady delivers unerring match grade performance for those who can't afford to miss. 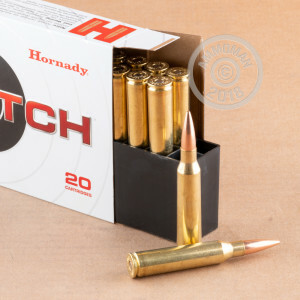 Each cartridge in this box of 20 fires a 285 grain boat tailed hollow point bullet designed to provide long-range precision for competitive shooting. These cartridges are made in Grand Island, Nebraska using non-corrosive Boxer primers and brass cases. 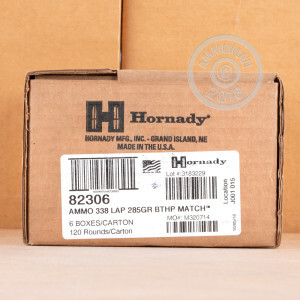 Place an order for $99 or more at AmmoMan.com (not so hard to do with match-grade ammo!) and get free shipping from AmmoMan.com!